Oh boy bunny, I do love you so! Hello Friends, thanks to your many requests I've made boy clothes, yay! It was a little bit scary to venture out from my comfort zone but I'm so glad I did. I see more boy clothes in the future. I have a full video tutorial to go along with this pattern so if you have never made doll pants before don't be afraid to try! friendly option at the bottom of this page. I hope you enjoy! times. Add a marker into the last st you put in. *not including the separating chain this row now has 25st *Please note in the video for row 11 I did sc instead of hdc which is a mistake on my part. Please use hdc. I will be fixing the video asap. 2nd pant leg: insert yarn into the first st in front of the chain that separated the pant legs and go in the same direction you did when you made the first pant leg. Flip pants inside out or right side out. That's the side it will stay on. Roll the bottom of the pant legs up the the ridge we created by crocheting in the FLO. You can add in a stitch or 2 if needed but they should stay rolled up on their own. Weave in yarn tails. Stitch up any gaps you see in the back of the pants. There might be a small gap where we connected the panel together on row 8. You can also sew the 2 corners together above the bunny tail hole or if you'd rather, you can sew on snaps or sew on a button. See video if my instructions are unclear. 9) This row we make 2 button holes. sl st into the 4th st from the front of the ch then sl st the next 4st, ch 3 and sl st in the last st of the row. f/o leaving a long tail for sewing. Weave in the shorter yarn tail to hide it. f/o leaving a tail for sewing. Weave in the shorter yarn tail to hide it. Make sure the buttons fit through the button hole then sew a button to the end of the strap that has no yarn tail. The other end gets sewn on the inside of the overalls as pictured. f/o leaving a long tail for sewing. Weave the shorter yarn tail in to hide it. When sewing around the pocket be sure to pierce the side stitches, sewing in a line down the edges of the pockets instead of wrapping (whip stitching) around the stitches. If you whip stitch this will create holes in the sides of the pockets. And you're done. I hope you enjoyed this pattern. If you'd like to show off your bunny and overalls you can post pictures on my facebook page, I'd love to see! This bunny with his overall is so cute. Thank your for sharing this pattern. So adorable! Thank you very much, I nearly can wait to have the time to make the boy and girl! Ein wunderschönes Häschen ist das geworden. What a very cute bunny! What a wonderful accessory for the sweet bunny. Thanks for the wonderful patterns. Good afternoon!! I was watching the you tube video for making the over alls, and I noticed that on row 11 you say to do 3sc, then 2sc but on the printed instructions it says to start row 11 with 1hdc in the next 3st then 2hdc in the next stitch. I just wanted to double check to see if we do hdc or sc. I love all of your videos!! Thank you!! my apologies, that is a mistake on the video. It is supposed to be hdc. I'll add an annotation to the video now. I don't know how I managed to let that slip by unnoticed! I thank you very much for pointing that out. Hi. I just found your fantastic videos a couple of days ago, and yesterday went out and bought everything to do some. I have never done crochet before but i am really enjoying it so far, and you make it so easy to follow along.I have the bunnies head done so far and will be working on the body today. I just want to thank you for doing the boys trousers as my eldest son picked this bunny for me to do for him (as he wanted the easter bunny) and my youngest has asked for 4 of your turtles from back in 2012, then as you may have guessed i have to come up with 4 masks for them to wear to turn them into tmnt for him. If it wouldn't be too much to ask, could you make more animal tutorials in the style of the spring rabbit and the valentine bear you did? It'd be really great if you could make a sheep or a cat or something like that. :) Thank you! P.S I love your tutorials and I'm currently making the rabbit! I love your designs. Can this overall fit the pig you designed? Ok I'm a bit confused and need your help. I've been following the pattern and using the video for reference when I need help but I've run into a small problem. In the pattern for row 11 you have 1hdc in the next 3st then 2hdc in the next st, repeat this 5, but in the video it's 1sc in the 3st and 2sc in the next st. So I'm wondering which is correct? Hi!! I love your patterns and crochted work!! I am in the middle of making the amigurumi Coraline doll. 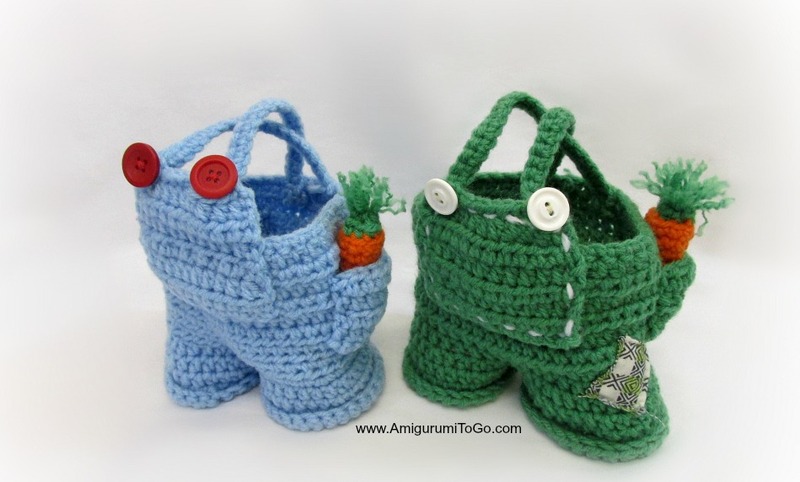 My question is, can I make the overalls and dress small enough for an amigurumi doll? If so, how do I go about doing this? Do you have a clothes pattern for dolls? Thank you!! you can use a lighter weight yarn and a smaller hook. You'd want to test the first couple rows on the doll you want them for to see if it's coming out a good size. Hi Sharon, I love the patterns! Just wondering what size of safety eyes you use for the bunny? I was wondering if the overalls would fit the fox. If they cant, how can I make some that can? no they won't. It would require a new pattern but I have so many projects on the go right now I can't write one up right now, sorry! I've got a little bit of trouble with row 10. You say to slip stitch the chain into the 20th stitch in front of the row. But when I do that I have one stitch short in row 11. What am I doing wrong? Or should I slip stitch the chain in the 21st stitch. don't worry about the number of stitches you have, sl st into the 20th st as it is written. there is a video to follow if you have too much trouble. And if you're still missing a stitch just add 2hdc into a st that requires only one and that will bring your stitch count up to the right number. Thanks for the clothes. It was hard to find free patterns of them. Fortunality i follow you on FB. After the summer season I'll start trying to making them. At the moment it's too hot to crochet, but I have a lot of patterns on my to-do list. I'm looking forward to make the bunny, the clothes and the basket. Hi! Firstly - thank you so much for your awesome patterns! I have a problem with the overalls though. I definitely did everything the way you did, but I can't get it to work. Around the waist the pants are much too wide, I can easily put 2 fingers in. My legs look wider than yours too (but my number of stitches was always correct). Also, it's a bit hard to pull the pants over the bunny's bottom. The tail is in the way (although it's sewn on the body quite low). I really don't know what the problem might be. It's a pity because it would look so cute! 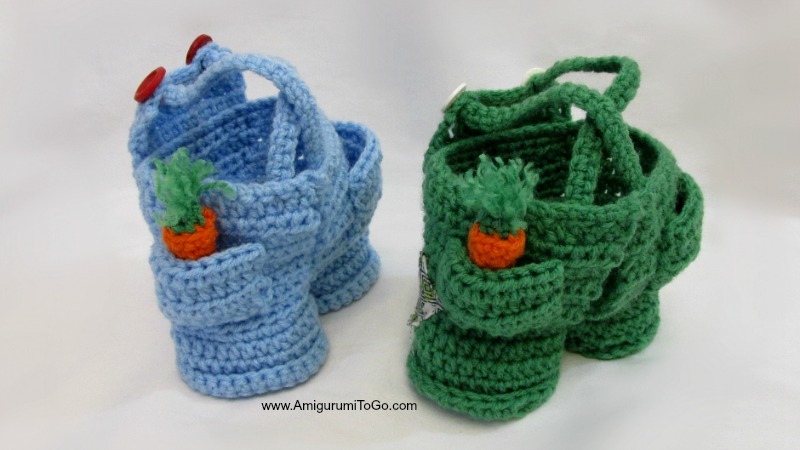 First I would ask if you are using the same yarn weight and hook size that you made your bunny with? And 2nd, the width shouldn't matter so much as you will be adding straps that will hold the overalls on. And yes, it does take some adjusting to get the overalls around the tail, that is completely normal for sure. I think I even show that in the video, I have to tuck the tail inside but after it's on the bunny and the tail is through the hole it's fine. 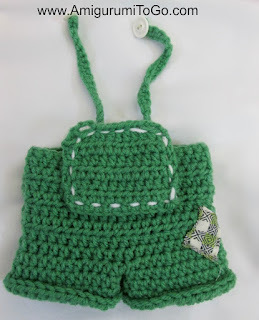 If your number of stitches are always correct and you're using the same yarn and hook size then I would suggest a smaller hook for the overalls and then maybe that will help is all I can suggest. Hope that helps! Yes, I've been using the same yarn and hook size. 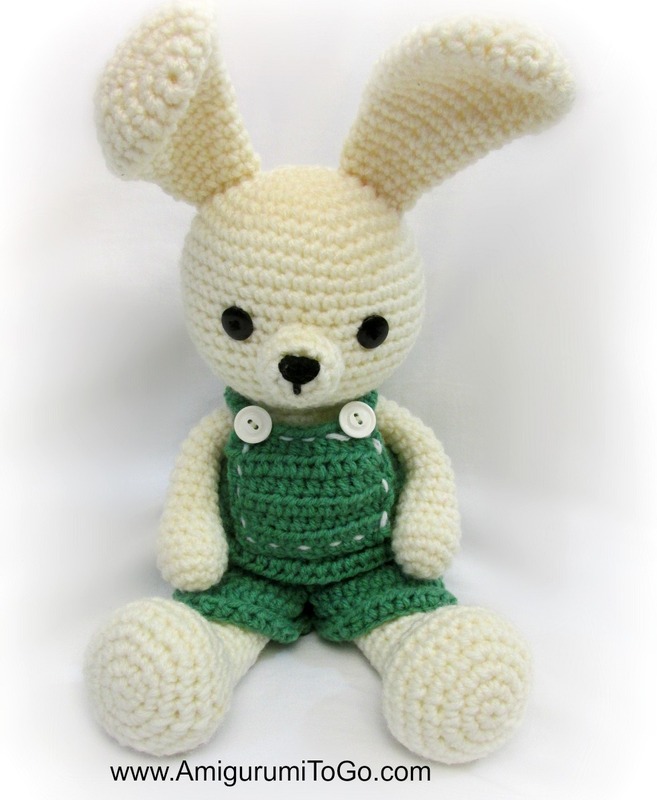 It's possible though that I wasn't crocheting as tightly as I did with the bunny. I'll try again using a smaller hook and working a little tighter. Btw - I've already made a dress too, and it worked perfectly. It looks soooo cute! Thank you so much for all your amazing patterns! Those will be the perfect Christmas gifts this year! Hey, this is me again, retrying to make those overalls, and I *think* I've found an error in the video (and please forgive me if I'm mistaken). In the written pattern you say 3-7 is 1hdc in each st.
Row 8 is 1 hdc in each st as well, then connect. To me that means I'm doing 6 rows of hdc in total and then connect. However, in the video you say 3-7 is 1 hdc in each st. Then row 8 connect and do 1 hdc in each st. That would be just 5 rows before connecting, which is what I did in my first attempt as I was working with the video. Now looking again more closely it does look like you made 6 rows in the video. At 7:19 you hold the piece into the camera and if I count right, there are 6 rows of hdc. Which would mean, when you say you're at the end of row 7 it's actually the end of row 8 (counting the chains as row 1). Again, if I'm misunderstanding something, I apologize. I just read your question again. rows 3-7 is 5 rows. You include 3 as a row. Then another row makes 6. So if you counted 6 rows that is right, lol sorry I was in a hurry this morning when I read your question but now looking again I think you just misunderstood that you include 3 in the row count so again, 3-7 is 5 rows add one more row and that does make 6 rows so you counted correctly and the pattern is correct as well. Karin, I am so sorry I deleted your last comment. I was trying to publish it then answer you but I hit the wrong button and blogger just deletes without warning. My apologies. I saw in your comment that I misunderstood you but don't know exactly what you said after that. *not including the separating chain this row now has 25st *Please note in the video for row 11 I did sc instead of hdc which is a mistake on my part. Please use hdc. I will be fixing the video asap. But that is the only mistake that I know of. Is that what you mean? No, the mistake you mentioned wasn't what I meant. What I'm talking about refers to the 3rd and 4th step of the written pattern. 3rd step is row 3-7 (5 rows of hdc), 4th step is row 8 (1 more row of hdc + connect). So in the written pattern it's clear that it's 6 rows of hdc in total. I'm supposed to connect *after* doing row 8. But in the video (at about 7:15) you say you got to the end of row 7, and right after that you connect. In fact you must be at the end of row 8 though, as there are 6 rows of hdc on your piece already, not just 5. In my first attempt I consequently followed the video without looking at the writtern pattern (and also not really reading the text in the video), I just did what you said. Thus I missed that 8th row and connected after row 7. That was the reason why the pants wouldn't go over my bunny's bottom so well. The new overalls I made with the written pattern fit much better now. thanks for hanging in there in trying to explain it to me. It's been a long time since I did the overalls so it's hard for me to see in my mind what you mean. I will go over the video again one of these days and see if I can find the mistake. I had planned on re-filming it anyway just as soon as I get the time to do so. Of course mistakes can happen! I certainly didn't mean to criticize, but just point it out as you said. Generally your videos are so clear and easy to work with! awww thank you Karin! I don't feel criticized at all, I know you are just trying to help me fix it. It's been a pleasure even though I didn't totally understand I will check into it and fix everything as soon as possible. Those overalls were the first pair of pants I made into a pattern, I'm actually not a clothing designer so it was hard for me to figure it out and get it into words for other people to follow. It's much easier for me to just make amigurumi with no clothes, lol But I will get better, it'll take me some practice. I'm hoping to get a large frog posted soon and he will be wearing these overalls so it will be a good time for me to re-do the video. Thank you so much for the donation, that was very generous and I appreciate it very much. All the best and of course, happy crocheting! I'm sure you will understand what I mean when you do look into the video once you get time. Just look at like 7:15 minutes. Unfortunately I don't have a facebook account, so I can't post pictures. But it's light grey and I made the top of one ear and one paw white. And the overalls are dark and light blue. I'm looking forward to seeing that frog! 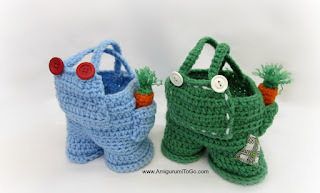 Will these fit the Little Bigfoot Bunny? Thank you so much for these patterns. I just finished a white bunny with pink tail for 1 of my daughters and am going to be making another in a light gray with a purple tool for my other daughter. I'm going to make the clothes too. Could these be adapted to make knickers to go under the dress? Thank you for sharing freely your patterns. The video is easy to follow and im sure takes time to orchestrate..so thank you for that also. in the supplies list I tell you to use the same hook size and yarn weight that you made your bunny with. There's also a full video tutorial if you need it. Have you tried the video? Thank you very much for sharing all your besutiful work. Question, is there a way for me to use the coveralls for the little moose? the overalls fit the large moose but not the small one. I can't you which to use since I haven't done it myself with this pattern but a lighter weight yarn and smaller hook is the way to make things smaller. Love your design! I can't find the same yarn in store, is there any different yarn I can use to replace it? Yes, you can use any yarn you want. Be sure to choose the appropriate hook size. Different yarn will result in a different size of the finished amigurumi. 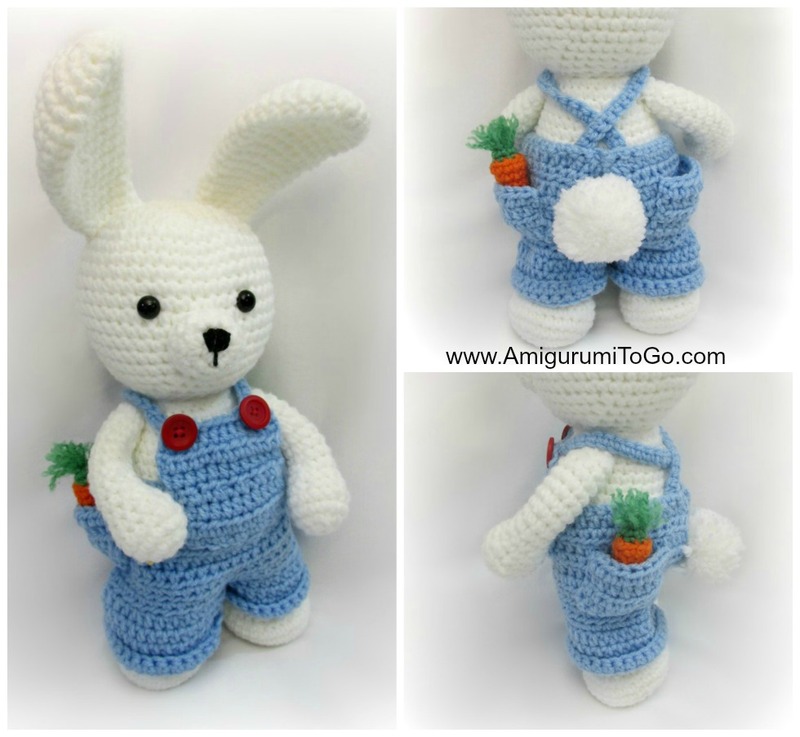 Be sure to use the same yarn weight for both the bunny and overalls. Have fun! Really love this pattern ... really adorable. Thank you for sharing it. Just to confirm do I use the same needle size for same yarn weight for both bunny and overalls? What size buttons did you use for overalls? sorry, I never thought to measure them. You don't have to use the exact size I did, yarn will stretch a bit if you have a bigger button, you can add a stitch to close up the hole a bit if you have a smaller button..
Have done several of your small animals. extremely well written and easy to follow. now having a go at Dress me bunny. Love the fact that you do videos for each pattern. You should be charging for your patterns i am sure most people would pay for them. Many thanks for your hard work which you share with everyone.